I would say all details. Whether there was a transition stage with some clean-up involved between that original mold and the mold that created the ESB helmets is unknown, but there is physical evidence to suggest more detail on raw casts of production helmets as they came out of the mold, than is even seen in the best fan helmets and casts from the Rick Baker mold. Evidence based on what? You've never even seen a cast from the Rick Baker mold in person. You'll find the most obvious worm clearly in a particular TIE fighter cockpit sequence. I'll post it later today if I remember. It was definitely there during production, at least part of the production. I still know what they lack. Cool. I'll check out the TIE sequences too. Does anyone have a good shot of the helmet from the side? Maybe from Comic con. I can only find front, top, front kind of to the side but I'm looking for a level straight side shot. Gino said he does not have any more pics and he thought maybe someone at Comic Con may have one. The thing is... the RB mold doesn't have the "worms". Only the UK one does... and now those worms have been placed in scenes in the movie during the end of production. You guys are slow Old thread. I mentioned this loosely a while back with Thomas saying about the tie and me the Tantive. I must have been sick that year. Anyway... there's no denying that the UK mold was made right smack at the end of ANH production. Evidence is there for all to see ON SCREEN. The question then is... if they still had the production mold - the one that made the screen helmet and duplicates - why make a new mold from a screen worn, battle damaged helmet? It can only suggest that the original mold was unavailable, but there were no deals for a second movie yet, so it wasn't to make new ones for future films... or what? - even though it was used for the subsequent movies! And... a raw cast from that mold would have an exorbitant amount of more details we haven't seen in ANY of the fan owned or licensed helmets. Really hope one pops up soon. It certainly puts the Elstree Carpet picture right at the end of production too... maybe even at the exact time just after it was molded. The worms were gone or removed by the time Rick Baker molded it in the US. This has turned into a really interesting thread, I enjoy reading and learning from you Vader experts. Yeah, it sure looks like there's something there, but it isn't placed exactly where the worm is... and it isn't seen on other RB mold casts. And I looked at the thread that Darthvaderv posted, but the picture in that thread isn't showing the worm, but the general gonk in that area, which is seen throughout the entire movie and would have carried over into the RB mold, which is also visible on those casts. You can see it more clearly in this one. Not a worm, but definitely something that can catch the light - maybe even what ripped out a piece of silicone when it was molded (the worms). But it was definitely there when they filmed the TIE cockpit scenes back in the US, as shown by SL's picture. Yes, and notice as well that by the time of the Elstree photo that with the repaint there was more added to it, the shape changed a little bit. And that shape is different from what you see in ESB. Perhaps there was a slight imperfection there originally but it was shallow, then with finishing it was built up a bit more. Perhaps the lighting in the TIE just brings it out more, or there was some touch-up on that side of the mouth after the Tantive scenes that added to it. What I was told was that the RB mold was believed to have been taken during the pickups of ANH. I'm not stating this as fact but what is believed by people who worked for ILM. Were the TIE scenes part of the production proper or were they "pickups"? Of course this discussion bears a lot on the TD ANH, which I have still been learning new things about. Maybe we should split this discussion off into a new thread? I had a look at that too but it isn't the same feature. I'm hoping to continue discussion of the cheek worm in this thread from the eFX Vader helmet thread. Can the posts from that thread be moved here if that is agreeable to everyone? Although it was discussed in relationship to what we see on the screen ANH mask, invariably it will lead to discussion of authentic castings as well, hence I placed it in this section of the forum. How it looks in that Elstree picture is not how it looks after the repaint. Sorry. And the worm isn't there at the time of the repaint. At that time it's back to normal with the minor gonk, but no worms. If it wasn't there through most of ANH production and gone again in appearances after production + after the repaint, your argument makes no sense. So what part of the Elstree picture suggests it was after it was repainted in the US for the appearances? I'm cool with taking it separate. Just shoot a staff member a pm and it'll happen. I didn't say that the Elstree shows the repaint as it appears in the Chronicles. That is an entirely different repaint, a more extensive and comprehensive one. 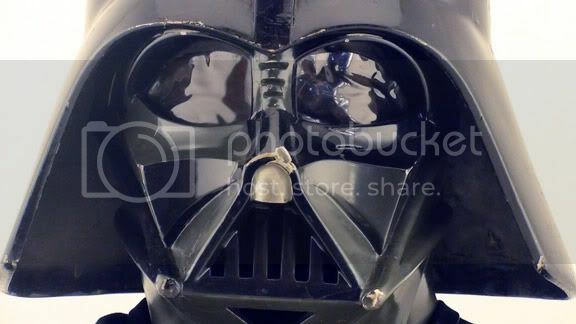 In the Elstree photo the mask is painted over in areas like Vader's left cheek and the neck. And that was before the Chronicles repaint. Here is what I meant how the worm in the Elstree photo is a bit different as if there was additional paint over it...it is angled a bit differently. Here I am actually comparing it to what I think is the worm on the original mask at the time of the Corbis photos.